Tourism businesses could increase sales in Scotland by up to £94million simply by making the most of Scotland’s world class food offering, according to a new guide. “Food & Drink Experience in Scotland” challenges tourism businesses – from restaurants to local tourist attractions and guest houses – to raise their game by serving up fresh, quality, local produce to improve the food and drink experience they offer visitors. Research suggests that people would be happy to spend an average 7% more on food and drink when they visit businesses with an authentic Scottish food offering based on quality local produce. This would be a real boost to the £800million each year overnight visitors currently spend on food and drink when they visit Scotland, second only to spend on accommodation. The new guide has been produced by Tourism Intelligence Scotland, a joint venture developed by Scottish Enterprise, Highlands & Islands Enterprise and VisitScotland, and is packed with information and tips on how to tap into this potential spend by giving visitors the best culinary experience possible. Speaking at the launch of the guide, Enterprise Minister Jim Mather said: “Scotland is a world-class culinary destination – as recognised by the International Culinary Tourism Association in its first ever worldwide study, which declared Scotland one of the most ‘unique, memorable and interesting places’ for food and drink on the planet. “Through the Year of Food and Drink, Scotland is working to promote and celebrate our reputation as a Land of Food and Drink so that more people, both at home and visiting Scotland, are aware of, and have opportunities to enjoy, our delicious produce. 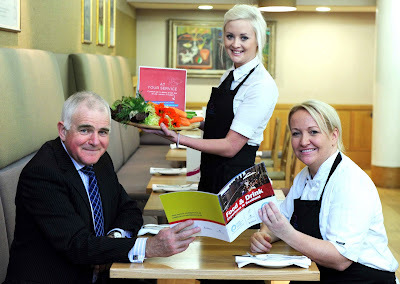 The guide suggests that by introducing Scottish food and drink to menus and promoting its provenance, businesses have an opportunity to attract a greater number of higher-spending and longer-staying visitors, increase recommendations and provide valuable support for local businesses and the local economy. It offers particular advice to businesses such as visitor attractions, as research has found that tourists spend more time and money during a visit when they are offered authentic local food in its restaurant or café. A complementary guide “At Your Service – A Practical Guide to Delivering the Best Food and Drink Experience in Scotland” has also been developed by Scottish Enterprise in partnership with Tourism Intelligence Scotland. It contains information for front line staff in tourism businesses and gives them easy reference facts about different food types, a visual calendar of seasonality, background information on classic Scottish dishes and drinks, and hints and tips on how to ‘up-sell’ to customers. “Food & Drink Experience in Scotland” and “At Your Service” are available free to Scottish Tourism businesses who register at www.tourism-intelligence.co.uk which provides a wealth of helpful insights and tips for businesses. The launch of the guides is the latest initiative from Tourism Intelligence Scotland (TIS), a joint venture developed by Scottish Enterprise, Highlands & Islands Enterprise and VisitScotland, in partnership with the tourism industry, to stimulate growth and innovation in tourism. TIS has recently entered an exciting phase of growth enabling it to provide an enhanced range of market intelligence resources for tourism businesses. These resources, which include the regular ‘Ear to the Ground’ newsletter, information on news and events, plus access to the latest research and intelligence, are free to businesses that register their details with TIS. The guide is part of the “Opportunities for Growth” series, aimed at helping tourism companies make the most of new and emerging opportunities in the sector. Other guides in the “Opportunities for Growth” series include: Knowing Our Markets…Scotland’s Visitors; Scottish Tourism in the Future; Walking Tourism; Listening to our Visitors; Golf Tourism; and Adventure Travel in Scotland. Scottish Enterprise is also providing through the Experiencing Scotland project, specialist food service advice and support to tourism businesses across Scotland. This will help create marketing opportunities for businesses across the supply chain, as well as increasing the use of local, fresh and seasonal produce at Scottish visitor destinations. Scottish Enterprise is Scotland's main economic development agency and aims to deliver a significant, lasting effect on the Scottish economy. Our role is to help identify and exploit the best opportunities for economic growth. We support ambitious Scottish companies to compete within the global marketplace and help build Scotland’s globally competitive sectors. We also work with a range of partners in the public and private sectors to attract new investment to Scotland and to help create a world-class business environment. There are currently 805 Ayrshire business stories permanently archived on this site. To locate those of most interest to you, please use the site search facility in the top right hand corner of this page.